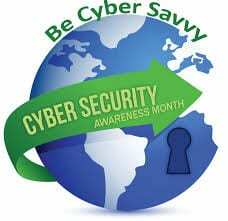 National Cyber Security Awareness Month is observed in October and has been since its inception in 2004 in the USA, making sure we remain safe online. NEVER open attachments received in emails if you cannot verify the source. Use https sites for your online banking, purchasing and other sensitive activities. Connecting to a VPN secures all communication on an unsecured hotspot. Share this tip with colleagues, help them to stay safe when travelling for work. Stay protected against harmful websites that steal your personal information. Avoid clicking through on popups whenever possible. Use a cyber security software programme on your computer and devices. Two thirds of millennials (59%) share their personal travel plans on social media sites, making it easy for cyber criminals. Whenever possible use two factor authentication methods. A secondary verification process for your accounts keeps you twice as safe online. Unsecured hotspots give easy access to Cyber criminals to target you and your identity. Always use secured wifi connections.